Because the real estate market continues to fluctuate with the economy, if you’re a developer, builder, real estate agent or homeowner, it’s time to get creative. Here are the best ways to sell your home today. We see significant shifts in buying and selling trends, especially in new residential sales. New home developers have to be nimble—there was once a time when there were line-ups of people eager to purchase homes in a new community on release day. That’s a rarity today. So, to help sell a home, builders and real estate companies are using new technology like 3D rendering, or image synthesis. Is it real or is it photorealistic? It’s actually a bit of both! If you take a close look at this rendering, it’s a photorealistic representation of an actual room using images of real objects placed in a scene by means of a computer program. It’s a 2D representation of a three-dimensional room. 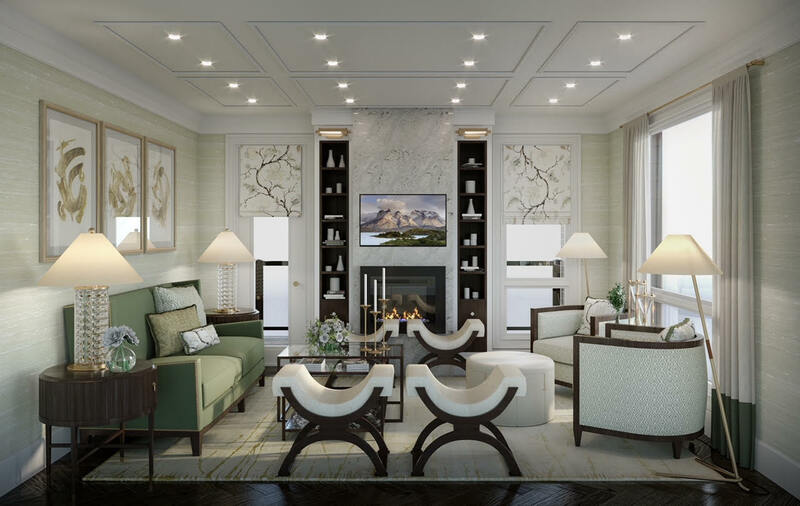 Using architectural rendering programs can bring a room to life, virtually. Everything in the photo was sourced by the designer and out on a floor plan. A graphic designer used a computer program to make the 3D photo. The bond between residential sales and interior design is growing. Good design has become more integral to residential sales. In the resale market, US company, Home Staging Resources’ 2018 survey showed 85% of all homes staged sold for 6-25% more than un-staged homes. The Real Estate Staging Association (RESA) is a North American wide non-profit group for stagers. They track statistics on how quickly staged homes sell. The results of a recent survey claim un-staged homes can sit on the market for an average of 184 days, while homes staged prior to going on the market sold on average in 23 days. So, statistically and visually, there is great value in hiring certified stagers for the selling process. It feels like you’re standing in this beautiful bathroom. Designing a model home in a new development presents the same opportunity but on a much larger scale. Developers want to create interest and excitement for potential home buyers. They are willing to invest the time and money into the process, and that means working with reputable designers to create a vision. A finished model home can take months to complete. Designers source out everything; furniture, finishes, appliances, fixtures, lighting, and accessories. The completed model is move-in ready. The result is not just a house, but a showcase that sets the tone for buyers in the community. The process is virtually the same with renderings. Each item is sourced but instead of finishing from construction to move-in status, the rooms are created photo-realistically. Each item is photographed, measured to scale and reproduced in a room setting that is identical to that of the finished house. Walls, windows, doors, flooring, and ceiling heights are exactly to scale, created by very talented computer graphic designers, who specialize in two dimensional and 3D computer design. Even the way the light hits the back of the chairs is controlled by the computer designer. 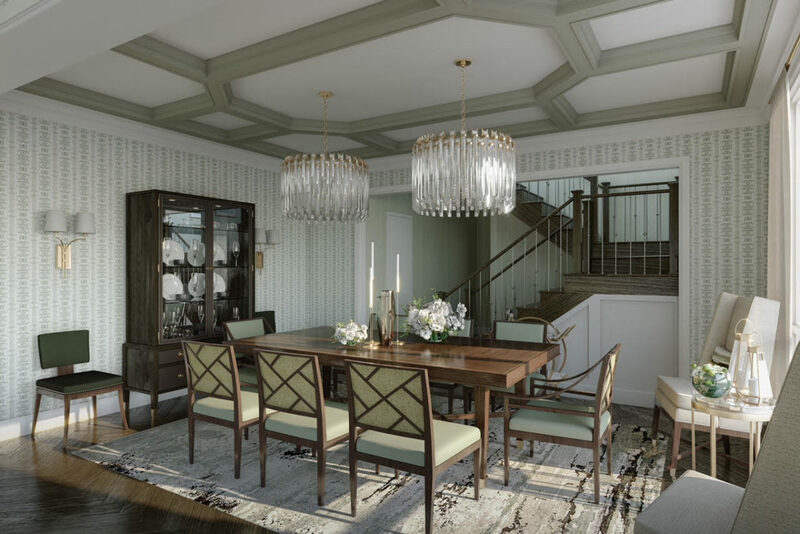 So, although we haven’t unloaded truckloads of furnishings into an actual house, we’ve researched, sourced and planned the placement for everything potential buyers will see. Will it replace model homes or the staging industry? Hopefully not. We still love to physically walk through a room and imagine living there. Today, these are the best ways to sell a home. 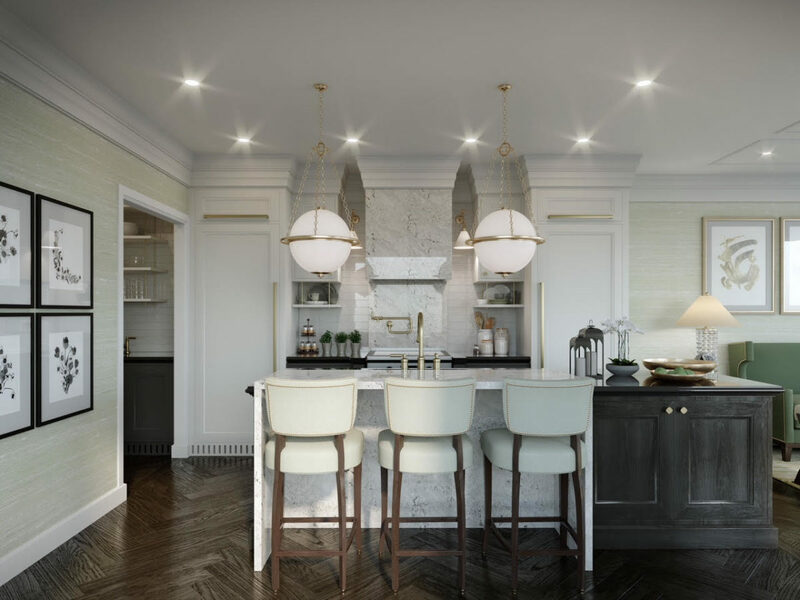 All images were sourced and designed by Jeff Palmeter and rendered by Nicole Vigneux at Caramel Brand for Primont’s North Oakville Sales Centre.